You are here: Virgin Islands News Online » News » Claude Skelton-Cline vs Hon. Mark H. Vanterpool: Who to believe? Claude Skelton-Cline vs Hon. Mark H. Vanterpool: Who to believe? ROAD TOWN, Tortola, VI - It was a late Friday evening on January 17, 2014 when most of us were getting ready to socialise that the National Democratic Party Government inked what they told us was a 15-year deal with Disney Cruise Lines (DCL) and Norwegian Cruise Lines (NCL). 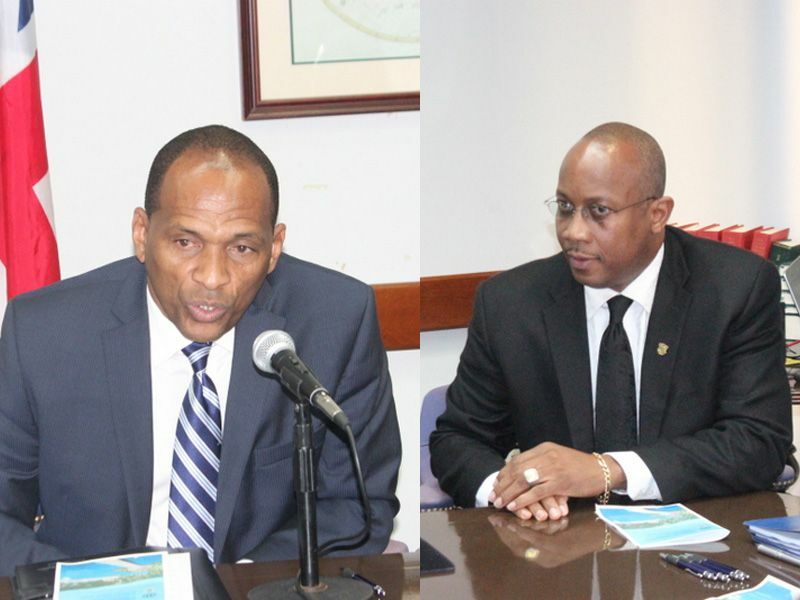 Premier and Minister of Finance Dr. the Honourable D. Orlando Smith along with the Minister for Communications and Works Honourable Mark H. Vanterpool placed their signatures to the agreement on the behalf of the people, the BVI Ports Authority and Government of the Virgin islands. It was there in an answer to a reporter’s question that Minster Vanterpool told the media that the agreement with DCL and NCL will be “made public” to the delight of many. It has been some three weeks since that the Minister failed to keep his word on the release to the public of the document leading many to question his knowledge of the contracts that he has signed with DCL and NCL in light of the recent press statement by the BVIPA saying otherwise. With the usual leaks in government and Virgin Islands News Online's supreme ability for inside information, a copy of the contracts were finally obtained leading to an article dated February 4, 2014 entitled; Has NDP deceived its people with NCL & DCL Agreements? It’s important to note that this news site went through the formal channels of checking with the Registry of High Courts and also both the Ministry of Communications and Works and the Office of the Premier to secure copies of the signed documents based on Hon. Vanterpool's promise on January 17, 2014. The Virgin Islands News Online article details a web of misinformation including that the Berthing agreement cannot be made public because of the many confidential clauses within, along with the ability for the companies to extend the agreement for well over 25 to 30 years despite us being told it is only for 15 years. Firstly, Virgin Islands News Online stands by our story based on the word from the Minister for Communications and Works that the information would be made public. In fact, more articles will be forthcoming from the agreement as we believe the public has a right to know what is in the agreement and how it affects our country and our children and grandchildren. It was this National Democratic Party Government who promised in the last general election campaign to have a government in the sunshine, and practice transparency and good governance and work in the interest of the people of the Virgin Islands. Therefore, the press statement from the BVIPA was rather alarming as it seems to be Skelton-Cline’s word that the agreement being released is a compromise of the contracts against that of his very own Minister Vanterpool who promised it will be released to the public! However, we will let the people decide in the coming days whether our reporting which we regard as fair public interest was “irresponsible” or the agreement signed by this Government. It is obvious to most that the Minister for Communications and Works Honourable Mark H. Vanterpool and the Managing Director (MD) of the BVI Ports Authority Claude Skelton-Cline are not always on the same page, especially publicly, as over the past year there would have been times when each of them would have been thrown under the bus by the other. Perhaps instead of trying to cover-up the Berthing Agreements signed on January 17, 2014 and justifying why it cannot be made public the Minister and MD should demonstrate a new era of working together and avoid the consistent contradiction of each other and throwing each other under the bus! nice peice VINO keep the good works up!! did you mean "birds of the same feather flock together"? geeeezzz..
Take it light man. Take it light, that's all I will say for now. Regrets will be forthcoming....don't say I ain't say! This government will continue to ruthlessly bully their way through and sign such agreements like this because it doesn't matter what the people think or whether they are voted out. The agreement is already signed and locked into so they and their cronies will reap the benefits for years to come. At this point, they're laughing all the way to the bank while our increments have been cut and the infrastructure continues to fail. Ha! VINO you late man, Platinum done break the updated news. The agreement will be released and we can all judge for ourselves. God bless vino had broke the story or else this would have been under the rug by now. Well we will have to choose the one with the best Character, Mr. Cline-Skelton profess he is a Christan man so he have the advantage over Mr. Vanterpool. I am not saying he not at fault here but just saying since we dont have the evidence we will have to choose from Chracter and faith LOL. despite the audit shining light on illegal and self-serving practices, this government goes ahead and does what it wants to anyway. The option doubling the time of the lease is disgusting. In 30 yrs, where are these people going to be? In their mansions, in statues, passed away leaving a big burden on the next generation? Cline, the original negotiator, has insider information, but is "not a politician". Vanterpool is the politician who said the agreement would be made public. Nothing is free and surely tax-payer money is involved which makes it public! These two so caught up in the madness they are doing that every move they make shed a light on their mistake. You don't put two hungry sharks together cause one will kill the other so he can eat. "Perhaps instead of trying to cover-up the Berthing Agreements signed on January 17, 2014 and justifying why it cannot be made public the Minister and MD should demonstrate a new era of working together and avoid the consistent contradiction of each other and throwing each other under the bus!" I just love VINO. This part of the article is hilarious. Did someone say Detroit, USA? What's all the hoopla about? The agreement will be released and half of you blogging your fingers off can't even read so it's no use to you. You will keep refeshing the page hoping for VINO to spoon feed you about the contents. lmao.. Shouting "release it release it" like most of them can read and understand it. There is a CULTURE of deceitfulness, lyning, graft, disobedience to law, obstruction and interferance in the Virgin Islands, The NEED becomes A GREED. Time will tell. maryland limousine is full service luxury ground transportation company in Silver Spring, maryland limousine, Reliable Limousine and Bus Service, LLC has a professional staff of chauffeurs,,,,contact us,,,!